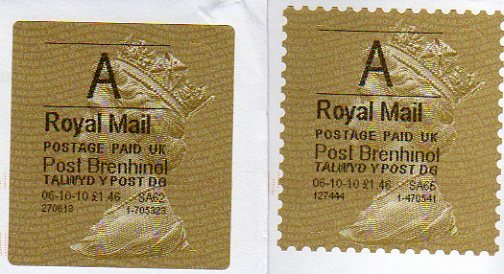 Second, one which should have been an A but through selecting the wrong on-screen options the branch produced an FP label, normally only used when an international item has been returned to sender for additional postage to be added. 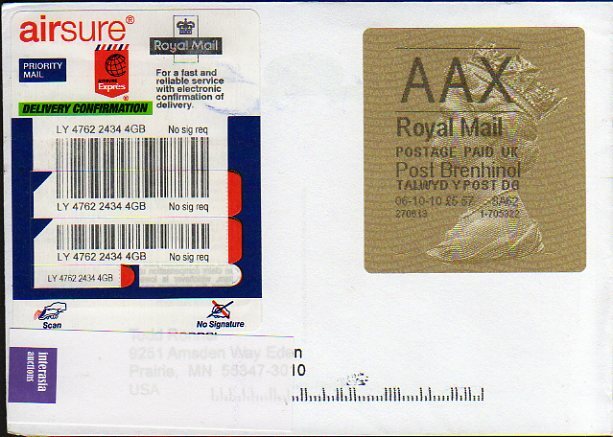 Lastly, showing the whole cover, an Airsure letter that has the correct AAX label. These can only be obtained by paying the £4.90 (currently) premium for the tracked-but-not-signed-for service. The imperforate labels are now appearing in English post offices so we can expect more widespread use of these. 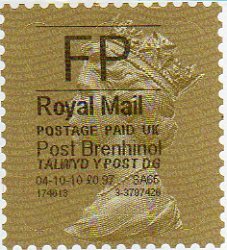 The perforated examples will be the less common, especially Welsh, and especially more unusual service indicators. Many of those appearing on eBay seem not to have been used but just obtained over the counter contrary to regulations. The best way to collect these for the postal historian, rather than just a label collector, is on cover or large piece to prove proper postal use. Let us know which England, Scotland and Northern Ireland offices are using the type 2 gold labels - use the comment form below. Hi Ian et al, The post office at Mile Lane, Bury, Lancs uses the plain edge labels. The guy behind the counter was complaining that the margin around the labels can come adrift and jam the printer, rendering it unusable. He was not looking forward to this happening on the run up to Christmas. I suggested that he could always use stamps but he did not seem impressed by that idea! Our post office is using white labels for precisely that reason - which shows the ***RARE*** tags on eBay for what they are!